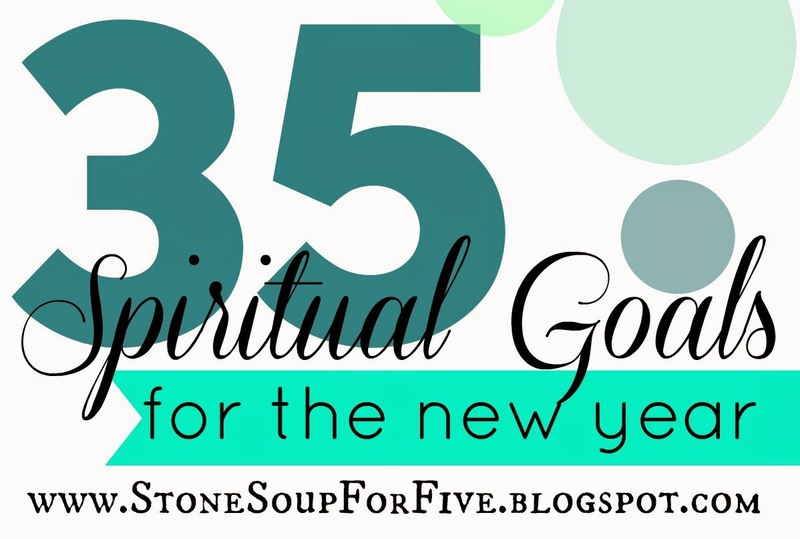 Stone Soup for Five: 35 Spiritual Goal Ideas! Since we're heading into a brand new year, I thought I'd share some ideas for setting spiritual goals. Here are 35 ideas to get your wheels turning for setting your own goals for the year. I recommend only choosing 2-3 for the year and not overwhelming yourself (like I tend to do). You can always add more as you complete them! Read a book of the Bible 50 times. Read good quality Christian books (there are so many resources available, but here's one to start with). Listen to an online sermon weekly. Serve regularly in your church. Pray daily (I have been more consistent than ever since setting up my prayer binder). Do an in-depth topical study over a Biblical subject you've been wanting to learn more about. "Ruin" your Bible by reading through and writing a heading on each page. Participate in a weekly Bible study group. Start or continue a gratitude journal. Pick and memorize a life verse. Disciple or mentor a younger believer. Find someone to mentor or disciple you. Form a personal or family mission statement and verse to memorize. Read through and understand your church's faith or doctrinal statement. Memorize some (or all!) of the Westminster Shorter Catechism. Read through or memorize historic Christian creeds such as the Apostle's Creed, Council of Chalcedon, and/or the Athanasian Creed. Read biographies of early church leaders. 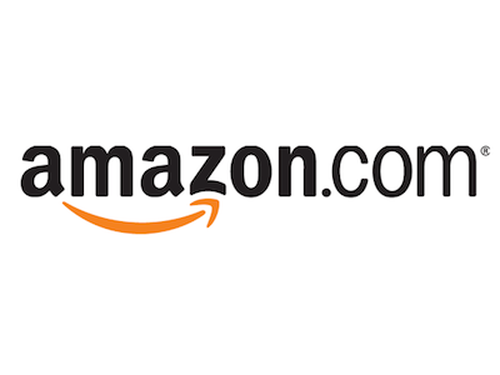 Give to a local charity or a charity you care deeply about. Figure out your personal doctrine (a great book for this is The Deeper Life). Review previously memorized scripture regularly (This 3x5 method is easy and excellent or this online one). Write out all the verses that refer to a specific sin or spiritual weakness you struggle with. Write out and study character qualities you'd like to possess or improve. If you're new here, welcome to my little home on the web. 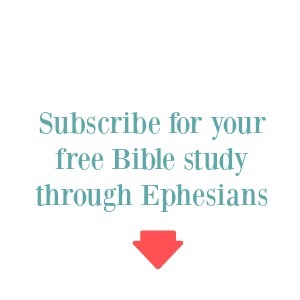 Be sure to sign up for a free Bible study on the side bar! They are original Bible studies with a mix of doodles, journaling, and inductive study that you can do in the comfort of your own home, preferably with a hot cup of coffee or tea! Great ideas! I'm especially drawn to writing out every "I Will" in Psalms and transcribing a book of the Bible. I've been getting back into the 10-chapters a Day reading plan and it makes such a difference for me. It's really the only one I've ever stuck to for any length of time. For me that means like a month, but I have high hopes for 2015! You should write out the I Will's. I LOVED it! So much wisdom and encouragement there! I love this list! I might steal an idea or two from this for my goals this year. I love this list!!!! Now to decide which 3 I'll do in 2015. I believe 3 is doable. Writing out the "I Will's" of the Psalms is in that top 3! 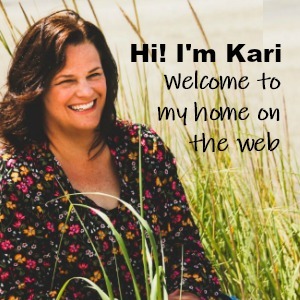 Thank you Kari for being here and sharing your wisdom. God's blessings to you and your family in 2015! I think three is an excellent number! I hope whatever you choose encourages you this year! This is such a wonderful list! It's so easy to get caught up in personal goal-setting, but spiritual goals are so much more important! Thanks for greasing my spiritual and creative wheels. I've just stumbled upon your insightful list here from the Makeover Your Mornings course. Thank you for so many wonderfully straightforward and doable ideas. This is especially inspirational for me as I've been longing to restart a personal devotional/spiritual growth time for myself, but haven't quite figured out where to start. Somehow I've let it go in the chaos of my family of five boys ages 2-8 but I'm missing it deep in my soul. Thank you so much for these concrete ideas! I admire your devotion, and I am trying to develop more devotion and connection to God in my own life. I am a life-long, active, worshipping Christian, and yet I know that I have much to learn and I crave more connection with Him. These ideas are a great place to start. Thank you! I also found you from Makeover Your Mornings! This is the second year in a row, I've used your list with my young adult small group to help them set spiritual goals. I've also linked to it for two years in a row on my blog. Thank you for compiling it. 3. Write out all the verses that refer to a specific sin or spiritual weakness you struggle with. this one will be lifetime, since Jesus walked on water and we cannot, ha ha. Everything else is YES! This is excellent! I'm setting some spiritual goals today, January 1, and your wonderful article has got me thinking!